The Big Day is coming. Months in the planning, but now only weeks to prepare. You and your bride have selected everything from the venue to the favors. As the day approaches, you take a look—a good, long look—in the mirror. Your bride looks at you, too. And, the verdict is you need some work. You’ll need at the least a haircut and a shave for all those photos. But what else? And where will you go for help? For professional help to get wedding ready? Be reassured that men are no longer treated like second-class citizens in salons, says Jessica Hammel of Berwyn’s The American Male. Barbering is expanding as more men do manscaping, and not just for the wedding day. The first issue is the hair on your head. And face. If you have any. Maybe elsewhere, too. Got a trusted barber who’s cut your hair for years? Are you happy with your look? Or have you been passive about your hair: longer or shorter, basically. It’s time to be proactive and definitive about what you want. A week or two in advance, make an appointment. Insist on your preferences. Go for neatness. And no major changes. If someone else has been cutting your hair—a girlfriend, mother or whoever is around—it’s time to choose a professional. In fact, give your new barber a test run, months before the wedding. If you’ve got a photo of the look you want, show it. Discuss the use of product. Kristin Blume of the Ultimate Shave in Glen Mills says there are now products “you can run your hands through.” Who knew there were some you couldn’t? But try any new ones in advance. Your moustache and beard, if any, require the same consideration as your hair for the big day. A specialist—The American Male in Berwyn, Shaving Grace in Exton, Ultimate Shave in Glen Mills, Blue Label in Phoenixville are some examples—will trim, shape and remove extraneous hair from your cheeks or neck. Strive for an open look, but neatness above all. This is not the time to do a full James Hardin. Ideally, your shave, whether full or partial, should be done as close to your wedding day as possible. You can do it yourself. Or you can treat yourself. A professional shave will take around 40 minutes, so factor time into your last-minute prep. In any case, a straight-edge shave, by a pro, will give you the closest shave possible. When you arrive, you’ll settle into a bib and comfortable chair, then lean back. To soften your whiskers and skin, an essential oil—perhaps lavender or eucalyptus—will gently be rubbed in, and your face wrapped in a moist, hot towel. A cleanser may be applied to open your pores. Then another towel. Warm shaving cream is next, applied and allowed to soak in, before a razor—a sharp, straight-edge razor—is taken to your face. Carefully, the blade will be drawn across your beard. Wielded deftly and properly, the blade will not pull or scratch as hairs are smoothly removed. Next, more shaving cream and a second pass. Then another towel, this time cool to close your pores. Finally, a balm or after-shave is applied, primarily to moisturize. Dry after your shave? Irritated? Consult your barber. But, ultimately, your face should feel smooth, like a baby’s behind. Your face—the skin on it—requires special attention. Without care, it develops wrinkles, age spots or dullness. Nearly everyone has pores that clog, causing all kinds of unpleasantness. The best results, according to Dan Cosgrove of La Difference, require a lifelong regimen, with attention at least every quarter. Kristy Cole of Cole Wellness in Wayne agrees. Not many of us are so meticulous. Yet, noticeable improvement can be made if you get a facial about two weeks before the wedding—two weeks because your skin may react, causing redness. Yes, a facial. For women, this has long been de rigeuer. For men it’s fairly new, but trending, particularly among under-50s, says Cosgrove. At La Difference, a facial begins in a quiet, darkened room with relaxing background music as you lay on your back, knees supported, with a heating pad beneath. The emphasis is on comfort. Towels and steam are gently applied. Your pores are examined in a bright light. Clogged pores are gently extracted with a specialized instrument. How long this takes varies, and it’s slightly uncomfortable. But only slightly. Olga at La Difference was very gentle. 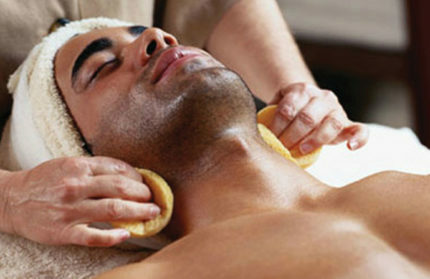 After extractions, your face is washed and exfoliated, cleaning the pores. Kristy Cole emphasizes that natural ingredients—jojoba to exfoliate and clean the pores, papaya to dissolve the dead skin—are used in her spa. Then a moisturizer, cotton pads around the eyes, and a mask are applied. The idea is to tighten, lift and calm down the skin, leaving you looking healthy and well rested. Now your nails. Clearly they need to be clean and clipped, more or less regularly and symmetrically, and filed. Again, your bride will definitely have this done by a pro. You should too. Think of it as a man-icure. Men may not think about it, but their hands are highly visible. And, on the Big Day, your hands will be on display and photographed with a new ring on your finger. At Currie Hair, Skin & Nails in Glen Mills, nail technician Diana Bearardy explains the process as she works. The manicure generally begins with a hand massage and ends with the application of polish or clear, as she calls it. In between, fingernails are clipped, filed and shaped. Your hands are soaked in a special hydrate solution, meant to moisturize. Cuticles—dead skin around the nailbed—are removed. In the end, your fingernails—in fact, your whole hand—feels refreshed. It’s like cleaning your home. There’s always something more to do. There’s hair in a lot of usually unnoticed places like on your back, chest and between your eyebrows. There may be gray at the temples. Maybe a pedicure, to complement that manicure? Self-tanning and teeth whitening? Or a relaxing full body massage? One thing is clear. Your appearance is important. Your bride and guests, not to mention the photos, will capture it all. And don’t think of your evening as over after the last dance. You’ll want to attend to your image and well-being long after the late-night after-party.